CityDance San Jose is a series of free professional dance instruction at Plaza de Cesar Chavez. The first lesson is this evening and the party continues every Thursday for the next seven weeks. Music will be provided by local bands and there will be plenty of dancing and good times after the lessons. An added bonus is a beer garden and food trucks from 5:30pm to 9pm. 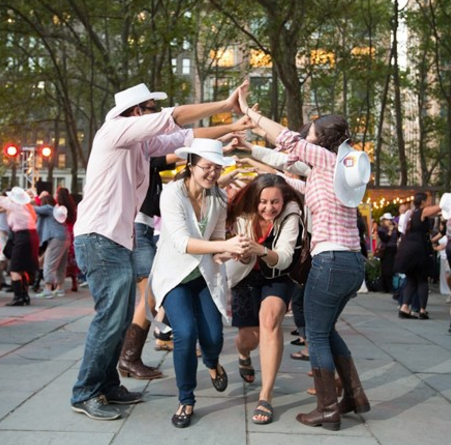 Sept. 1 – Salsa, instruction by Eddie Valdez and music by Los Boleros. Sept. 8 – Country Two-Step, instruction by Michelle Crozier and music by Country Cougars. Sept. 15 – Hustle, instruction by Eddie Valdez and music by Alfie and XS. Sept. 22 – East Coast Swing, instruction by Lesley McIntosh, music by The Fabulous CruiseTones. Sept. 29 – Bollywood, instruction by Joti Singh, music by DJ Puran Singh of KGS Entertainment featuring Gagan Singh Dholi, Dhol Player. Oct. 6 – Argentine Tango, instruction by Conor McClure and music by Tangonero Trio with Claudio Ortega and DJ Steve. Oct. 13 – Foxtrot, instruction by Hans Schmidt and music by The Serenaders. Oct. 20 – Rumba/Merengue, instruction by Michelle Crozier and music by The Alison Sharino Band. Oh, and while you are at Plaza de Cesar Chavez don't forget to try out The Swings.